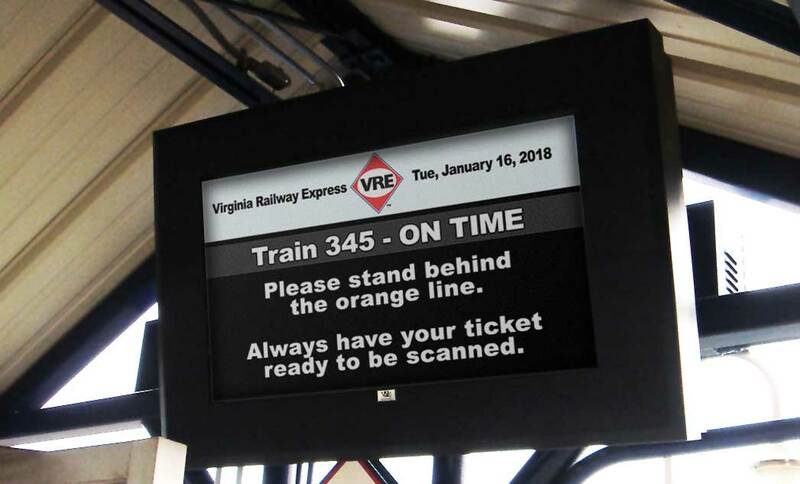 Virginia Railway Express contracted International Display Systems (Sterling, Virginia) for an outdoor digital signage project to upgrade a total of 18 train stations. International Display Systems had worked with ITSENCLOSURES, in the past, on previous outdoor enclosure projects and knew that we were the right company to design and fabricate weather-proof enclosures. In the Fall of 2007, Virginia Railway Express desired to upgrade existing, out-of-date LED scrolling signs to dynamic digital signage. The signs would be used for train schedules (both on-time and delay communications) and any pertinent passenger announcements. With Virginia temperatures ranging from below zero to nearly 100 degrees Fahrenheit, VRE recognized the need for outdoor LCD enclosures that would protect against weather extremes, environmental conditions, and potential vandalism. The train stations contained various sizes and forms of beams and poles, so a variety of enclosure mounts would need to be utilized for the project. Thermal management would also be essential throughout the planning stage, so that the screens would not freeze in the winter and/or power down during the sweltering summer months. 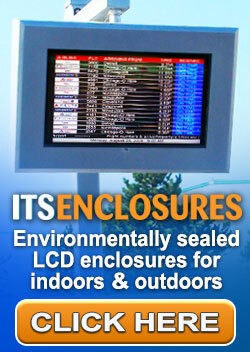 ITSENCLOSURES installed numerous ViewStation single and double-sided LCD enclosures (powder coated black) that housed 40" monitors. The key-lockable enclosures were mounted to beams on the ceiling with drop pipes and most of the mounts required a suspension assembly or arm support to install an air conditioner. 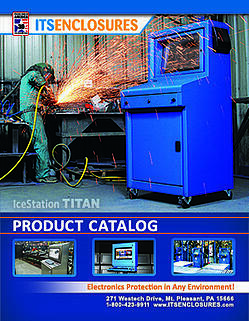 Each enclosure solution incorporated a 1,400 BTU outdoor air conditoner with a built-in 450-watt heater. VRE worked with ITSENCLOSURES to upgrade all of their stations with eye-catching and state-of-the-art ViewStation LCD enclosures. In 2011, VRE placed another order for two, double-sided 42” LCD enclosure Arrays.